The advantage of the Cairngorms with kids in tow is that the walking opportunities are almost endless at all levels depending on your child’s level of interest and energy. Almost every village in the Park has had a network of paths put in with the support of the National Park to give both locals and vistors extensive opportunties to explore through the woods, across the moorland, around the lochs etc. And if you want to do a wee bit more of an adventure you could try one of the Treasure Trails or try the permanent orienteering course at Glenmore. 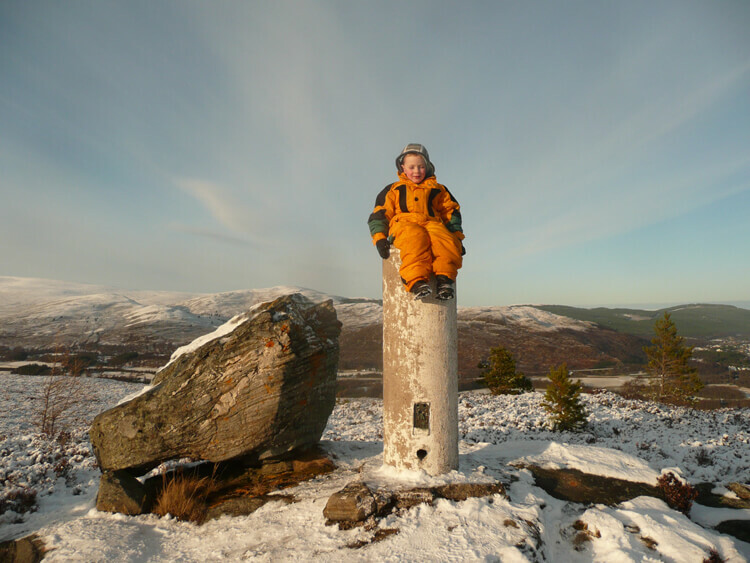 There’s as wide a range of walks to do with the kids as you have time for here in the Cairngorms and the majority of the walks are circular so you don’t have to retrace your footprints. Walks vary in length but the majority are aimed at being no more than a half day’s activity so you could also do something else with the rest of the day – visit a castle, see Dolphins, go to Landmark Forest Adventure Park, go for a wild swim or a swim/slide in the swimming pool, try another activity, visit the polar bears and tigers at the Wildlife Park ….. The plethora of opportunities mean that we have trouble understanding why anyone would only want to spend one night with us; but perhaps not everyone is into the scenery and the outdoors. Treasure Trails have produced a series of mystery/adventure stories where you solve the clues/puzzles along your walking route. The trails are available all over the UK, even in the Cairngorms National Park. We have a stock of the local trails here at Fraoch Lodge so if you want to spice up a local walk instead of just admiring the scenery and seeing what nature you can spot (giant anthills, ripe bilberries, raspberries, mushrooms, red squirrels etc) you can try one of these trails or purchase your own from http://www.treasuretrails.co.uk/scotland-northeast/things-to-do.html There are trails available in Aviemore, Kingussie, Newtonmore, Forres & Grantown on Spey among others – all of which are easily accessible from our base in Boat of Garten. 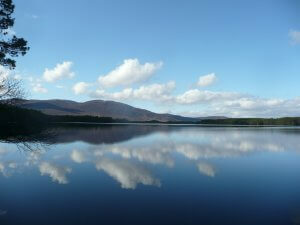 Loch an Eilean– voted Britain’s most popular picnic spot. The Loch is a very attractive spot with a ruined castle on it. The path around the loch is a forest path. There are rocks and tree roots along the way but then that’s nature. The root is not really suitable for push chairs but can be managed by relatively young children. Full details are available on the link provided. Craigellachie Nature Reserve– a lovely wee walk for all the family which passes a wee lochan and can be extended up the hill if the enthusiasm is there. Loch Garten and Loch Mallachie– Just a wee stretch of the legs, but in season the break can be extended to include either a loop through the forest or visit to the RSPB visitor centre (open Apr – Aug) to see the Ospreys. Farleitter Crag and Uath Lochans – This route must be access by car as there is no public transport down Glen Feshie. There are several way marked routes in the woods behind Fraoch Lodge and they are all marked out. You can even see the Capercaillie statue made from wood with the help of the pupils at the school. We also have a woodland ranger who leads walks and produces a blog for the village (on the website). The walks have a minimal charge associated with them but are extremely informative. Examples of the routes are: The Salmon trail – or the Red Squirrel trail. 1. Boat of Garten to Aviemore– This is a lovely section of the Speyside Way which if done from Boat to Aviemore means you’re facing the Cairngorm Mountains the whole way and if you’re lucky the steam train will puff past you as you walk. The route comes into Aviemore past the Spey Valley Golf Course and Cairngorm Brewery before getting close to the centre of Aviemore. 2. Boat of Garten to Nethybridge (or extend to Grantown on Spey)– the main problem with extending the walk through to Grantown on Spey is the number of gates you have to go through along the way – but you never know that could turn it into more of an adventure for the kids. There are also several fixed information points through Balliefurth Farm explaining a little more about the countryside and the bonus is that you’ll come down to Grantown past Spey Valley Smokehouse where you can view the workers producing packs of smoked salmon to be distributed across the country. Glenmore to Aviemore – can be accessed by bus. Ask for details while staying at Fraoch Lodge. Carn Eilrig – see Andy for route description and full details. May be for older kids or for a bike/hike combination. Cairngorm – from the ski car park to the summit. Children from age 5 or 6 can probably manage this walk on a fine day. The bonus is that they or all of you can summit your/their first munro without actually climbing up 3000ft. This is by no means a comprehensive list. A great many other options are available. Andy will be very happy to discuss with you as many options as you wish when you come to stay. He’ll then be able to tailor all his suggestions to your experience, ambitions and weather. For some other options which you may like to read about before you visit, you could always try the Walk Highlands website. We have worked closely with Helen and Paul Webster who run the site. They too are experts on the walking opportunties in this area as they live in Grantown on Spey.